NEW RULES POSSIBLE – Parties and candidates in the 2021 Yukon election may face different rules from those who ran in 2016 (above). 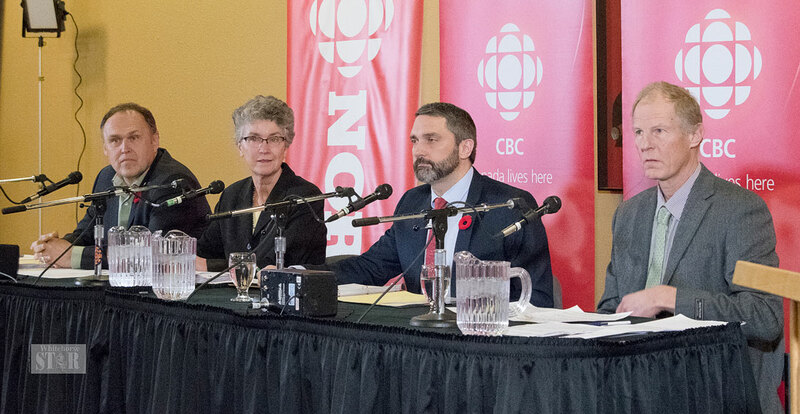 Seen left to right at a forum: then-Yukon Party premier Darrell Pasloski, NDP Leader Liz Hanson, Liberal Leader Sandy Silver and Green Party candidate Frank de Jong. • improve how Yukoners make their voices heard. The Yukon’s southern neighbour, B.C., rejected making a change to proportional representation in a referendum late last year and opted for the status quo of first-past- the-post. Liberal majorities - Is there anything they won't try to do? Yes but of course...we must manipulate the system to increase our chances of continued lordship over the peasants. Lemme guess, voting booths set up in refugee camps all over the world, no ID no problem voting, dropping the age to better indoctrinated era. Very, very serious games these seditious team red blowholes are playing, the time has come to be exponentially more serious than we have been. Last round of electoral reform we got nagged by a seventh century sycophant that washed ashore under 100% false pretenses....to infiltrate our system of government. agenda to globalize, and discard our sovereignty. Everything above is factual, within terms but most certainly not from a Liberal echo chamber...serious times call for serious discussions. The make up of this commission I find disturbing. This does not sound like an all party bi-partisan initiative but rather two spectators with little or no say in the TOR or selection of commission members. The Liberals are holding tight all the cards and have only invited (in my view) the two opposition leaders to give the appearance of a united front. I don't like the fact that the makeup is left with one party, and worse the governing one. This process and outcome is far too important to be left in the hands of the governing party, or any one party for that matter. The TOR and the makeup must include all three parties, all with an equal vote and compromised solution for the commission makeup. To do other than that will constitute the appearance of a one party solution. Furthermore I for one want a definitive say by way of a referendum on any future direction, anything short of that is inappropriate and would smack of "we know best". Politicians should never be in a position to tell the public how they will be elected. That is for the people to decide! Your job is to govern our job is to decide how you get elected - remember who your masters are. It seems that this has already been debated Nationally for the first 2 years of the liberal government living up to the mandate promises and the country said No. Google "Electoral Reform" and start reading all the way back to 2016. Nationally it seemed that people said if change to the electoral system was to happen it should be a national referendum put to all Canadians. We may be in the Yukon but we are still part of election processes and our Yukon Government links with Federal in many of the same aspects. I feel that our Yukon Liberals are trying to do the same thing that has already been done. Town Halls and such have been done here in the Yukon with Bagnell and Monsef held them over a couple of nights back in 2016 and I recall last November we had elections boundaries commissioned and the end result of that was the liberals defeated their own bill to change the electoral boundaries. The commission that was put together to review this contained: Justice Ron Veale, and included representatives from the three parties: Parsons (Liberal), Smith (Yukon Party) and Tayler (NDP). Lori McKee, then Yukon's chief electoral officer. So with what is being put forward currently with a committee being formed it seems a little redundant as it has already been done on a national level. The only way you will really know what the people of the Yukon want in this regard is to have a vote like BC just had about theirs and truly listen then instead of a committee that will not hear from everyone just a certain portion of people.